Absorb the deluxe energies of deep pink Inca Rose. 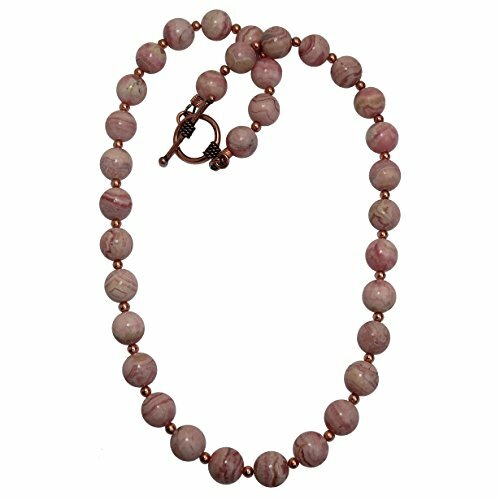 Also known as Rhodochrosite, this soft to bold pink patterned stone is polished into genuine round beads. The high-quality gemstone necklace is secured with a copper toggle clasp. Limited-Edition: You will receive one item per order; each stone will vary slightly from the others. The necklace will arrive in a Kraft jewelry gift box. Thank you for your positive presence at Satin Crystals! Disclaimer: Due to the natural state of stones and handmade items, you may find varying colors, patterns, inclusions, dips, crater and veins within organic stones. Healing information is for entertainment, not a replacement or supplement to medical treatments. Made in USA. Includes Satin Crystals gift box. Rose Quartz opens the Heart Chakra to love energy. Tigers Eye is a stone of confidence and courage. ach necklace is handmade in the I Dig Crystals studio in California, exclusively for the Satin Crystals Boutique.